Damnit... someone answer me Who did the 2 panda pieces (pandas rock & the circus panda)? And are those available as prints? ahh sorry, that's a guy called Pure Evil.. or nit used to be last year from the states I think. Those are quite funny. My favorite so far from the pictures I've seen are those Ben Turnbull pieces. Nu - you going to make it down to SG this year? Hi, nothing planned, so if I do it will be through sheer boredom and on impulse, slammed with work this end and to be honest, not really that into 'shopping'.. though a combined trip to the tate, stolen space, serpetine and the ghetto would make for a good weekend ;D Birthday on the 15th, so maybe a trip is in order. You get the info on the Panda's ? Pure Evil, working out of San Fran these days.. he had Panda canvas at Santas last year, edition of ten, 250 quid each, doubt you'll get em for that these daysd though. Lots of work up on beautifulcrimes.com if interested. sorry if this has been asked/answered before but who did the Sid, Jimi and Elvis pieces? really really want to get my hands on one and if its Ghetto only im gonna have to make up with my Ex in London! help me!! Wow... you like it that much? yeah got no chance of getting down to London, she is my only hope....balls. Yeah, they're by insect, heard they'd sold out though, but maybe that just means out of stock, they usually restock with stuff over the month. I got an unsigned Sid today so not all gone. No Jimi's though and I didn't ask after Elvis. the pics are great. thanks alot. I can't wait for Santa's Ghetto Sydney. Bet they didn't queue up on the Saturday! www.dailyindia.com/show/88529.php/Brangelina-pick-up-Banksys-art-that-mocks-Michael-Jackson! What are everyones views on the meaning of this??? everyone knows that michael jackson lift in a fairytale and enticed kids into his house to the thempark and stuff - i think this is a reflection on that by literally putting him in a fairytale! I was thinking maybe it wasnt just a cheap shot at Michael Jackson but it was related to the fairytale of Hansel and Gretel a little more. 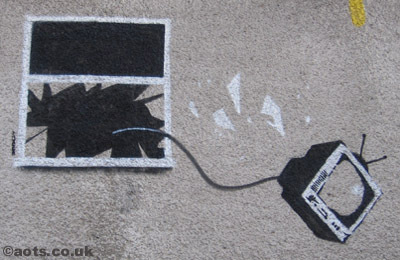 It comes across to me that Banksy is saying how people have realised how they can make a quick buck by lying about things through the media, such as the Michael Jackson cases. Then again i could be looking into it too much..?? Sorry does anyone have any info on any new INVADER action at the GHETTO??? I heard someone mention something but cant find any pictures?? There is a large mosaic of alex from a clockwork orange, looks pretty cool, see the ghetto photos, is in there. I really want one, how much were they? Did you happen to grab say 10??? Thats the only thing so far I feel like Im missing out on being in Sydney! There was no print when I was there! But I did get myself an unsigned (too poor) Sid. If anyone is going to SG feel free to grab me a signed alex and meet me in swap city.. sort of feel 150 pounds is a bit steep but its a good looking print. aza that Alex does look good, well done!